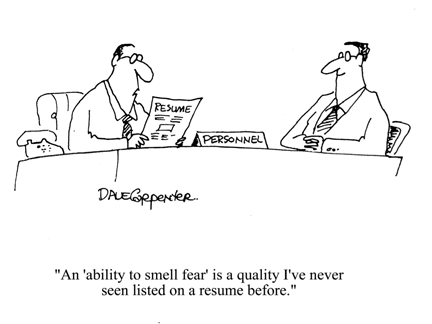 Kicking off our search for a VP of Marketing this week made me ruminate about bad resumes. For this role, the problem is that marketing people can make anything look good, or more accurately: they can talk at length about anything, even if it’s irrelevant. So, the primary problem is long resumes that put you to sleep. I thought this a good opportunity to get crabby about resumes in general. Most mortals can fit their background on one page. After about ten years of experience, you might merit a second page. Maybe. But think hard first. It might take 15 years before we need to hear it all. I have seen some resumes that creep onto a third page that are well written, but these are people with 20 or more years of experience. Four pages are uncalled for unless you are from a foreign country where the sheer weight of your resume is part of the Feng Shui and culture. In spite of this habit overseas, it is a practice that is doomed in a world of impatient, ADD Type A’s who spend more and more time on the Internet. Get over it. Practice using that delete key, Champ. Let the facts speak for themselves. Nothing is more annoying than resumes that start with a half page or an entire page summarizing someone’s background and skills. Your experience is what counts, not your interpretation. I have seen good resumes that start with three pertinent bullets highlighting key experience, but unless you merit a two or three page resume, try to skip this. Your work history and specific accomplishments are what matters. “I am a marketing master that can develop unlimited campaign ideas from the fertile right side of my brain.” I kid you not. A Master with a Fertile Brain. Save me. “Strengths (Source: Gallup Clifton Strengthsfinder): Maximizer, Ideation, Strategic, Self-Assurance, Activator.” Is this necessary? Aside from being very unclear on what a “Maximizer” exactly is, or for that matter an “Activator”, what God-Help-Me is the Gallup Clifton Strengthsfinder? If you have ever interviewed with Heidrick & Struggles or any of the major executive search firms, you know that competent, highly paid recruiters are exacting about chronology. Even if you are a CEO, these recruiters will carefully go through every crevice, so no stone is unturned. That means month and year, start and end to every job. Yes, the month matters. It demonstrates you are a concrete, specific person. Remember, this is your career. Here in swashbuckling Silicon Valley where folks go through jobs like hot knives through butter, a string of jobs all less than two years is not uncommon. Therefore the month becomes material. If you can get these three things right: 1) brevity, 2) background not strengths/skills/functional nonsense, and 3) clear chronology, you are off to good start. This entry was posted in Atlassian, Marketing, recruiting and tagged Atlassian, Marketing, recruiting, resume. Bookmark the permalink. Jeffrey, I remember doing a Gallup Organization Strengthfinder test 5-6 years ago. You get a certificate and a summary sheet that explains the key findings. I suppose it may have value to HR types, or Recruiters who are familiar with many of these tests. Great points Jeffrey. I tend to toss resumes that so full of buzzwords and hyperbole that they read like a get rich quick ad. People just need to be clear and concise and list their accomplishments. Very interesting points that raise an all too knowing smile! Fertile brains and Strength finders aside, why do individuals feel that being ‘shocking’ (and I say this word with tongue in cheek) will give them any sort of advantage? Human nature is a very subjective topic to quantify and sadly from a recruitment perspective it is only experience that can identify the real potential from paper… Does anyone in their right mind feel that psychometric babble gives them any sort of advantage pre or post interview? … now one thing that I find always helps with an application is the ability to spell one’s name correctly! Having reviewed several thousand resumes my main focus is always on “results.” “Unlimited campaign ideas,” in your example is worthless. Ideas with no results or measurable achievements is nothing and the resume should go into the round file. Well Jeffrey, Joel Spolsky had it right when he said that “great people are never on the [job] market”. The corollary to that is unfortunately that when they DO enter the job market for whatever reason, chances are that they will not be able to write a good resume even if their life depended on it – simply because this is the skill they never had to properly learn. I would risk the hypothesis that the better looking resume, the greater chance that the person is not really that great, but life has forced them to read many texts like yours above and they have simply followed your advice in order to please you (or other recruiter). Which obviously makes your life even more difficult. true on all 3 counts. Most of my hiring managers stop after 2 pages. a page of bullet points listing your perceived strengths is ridiculous. clients want to see where you last worked, when and what you did. we slash and burn resumes down to a managable size all the time. I’ve always struggled with the traditional resume format, particularly since I’ve been one of those people who has tacked throughout my career, rather than sailed in a straight line right on through to the corner office and the fancy title. What’s difficult in resume writing I find is that everyone wants something different. How are you to know what they’re looking for exactly? As someone mentioned earlier, it’s tough to know what to write if you don’t know your audience, but on top of that no one seems to agree on what the best way to write a resume is. That said, there’s probably also something to the notion that if people don’t see something worth grabbing on to in your resume, then perhaps that’s not the right company for you. I’m not sure I agree with your point about the specific date you received your degree. At least in the US, it’s illegal to ask someone’s age in the job interview process. If you assume someone took the standard path through their school years, you can make a pretty good guess at how old they are. As a “woman of advancing years” I prefer to have my work stand on its own, not be judged by how many grey hairs I have! Thank you so much Jeffrey! This is just the kind of advice I needed. just pay someone else to write it lol. Well said KathyT. I leave off all schooling dates (unless it’s postgrad) and let the facts speak for themself. Thanks for the guide, i will be sure to follow it to the point, i will get a great job with this. Thank you for sharing your thought. I am actually to use them, as now looking for a job, so, need a resume too. However at length might point out that too short isnt any better then too long. My “website” is my current resume (with no personal information in it) which I just completed yesterday and I will be trying out this week by job hunting. I think it is eye catching, and since I am just looking for a customer service position, I feel it would be enough to do the trick, hopefully. I did list a few skills on the resume, which I see is not a good thing… but as I stated, I will try it out… They are just general skills for the type of position I am looking for. Also, My boyfriends resume is 8 (YES, EIGHT) pages long!!! BUT it is exactly what employees are looking for and they LOVE it!!! He has not had 1 bad complaint about it yet, and it actually helps him out a LOT due to the fact that it lands him the job 9 times out of 10. But it’s due to the fact that he works in I.T. and they do prefer to have a more clearly defined resume, as he has been told by head hunters/contract agency’s in the past. I think a resume with spelling mistakes is the worst. Nothing shows a persons level of education like poor spelling and grammar. Also poor formatting that is why I write it myself online at resumizer.com. I had a friend in IT Project Management who once submitted a 31 page resume. The company contacted him and said while they were impressed with his resume, they felt it was a bit thin in places and asked for more information. He sent back 43 pages. And got the job. At $1000 a day. You are so awesome! I do not believe I’ve read anything like this before. So wonderful to discover someone with a few original thoughts on this subject. Seriously.. many thanks for starting this up. This web site is something that is needed on the internet, someone with a bit of originality! Pingback: How to Write a Bad Resume | Pam Condie Résumés! What a nice web site and intresting subjet, I will come back for more. Thanks. I think this is a good example of a good web site, what a good layout. Regards. what about boring people in boring jobs who don’t actually contribute or increase the numbers of anything? Concentrate on your background. Others will determine your strengths – great piece of advice. @Melissa: 8 pages for a resume? This is just wrong. I work in a Fortune500 companies, our CEO has two pages. Get a decent template http://www.hloom.com/download-professional-resume-templates/ and make it right. 8 pages is way too long, nobody is going to read it. It’s now not necessary that each one members of society have procedural mastery of basic arithmetic.